A photograph of Strindberg, taken during his last walk in April of 1912, shows a dark figure surrounded by whirling snow. His face is in shadow, almost blank. The expression changes: a sick, introspective old man, an aggressive hunter, an elder reconciled with the world. Compare that picture with one from the same month in 1875. It shows a somewhat effeminate, elegant young man who, with eyes wide open, stares determinedly at something slightly beyond the camera. The two pictures span a writing career encompassing close to seventy volumes and more than ten thousand letters. The images span a life; three marriages, five children, long visits abroad, numerous homes, several court proceedings, innumerable friendships and almost as many severed bonds. The productive life of Strindberg parallels almost exactly a historical epoch beginning around 1870 (the Franco-German War 1870-71) and ending dramatically with the beginning of World War I in 1914. During that period the industrial revolution culminates in a new world order with the imperialist West dominating world politics. It is the glory days of the bourgeoisie, often symbolized by the British Victorian era. To the heroes of Jules Verne anything was possible; Around the World in 80 Days was an astounding world hit in 1873. The Stockholm Exhibition in 1897 was dominated by the Hall of Industry and the Swedish engineer S. A. Andrè flew a hot air balloon toward the North Pole (one of his companions was the nephew and godson of Strindberg; Nils). This was the birth of modernity and of modern Sweden. In 1850 people travelled by horse and carriage, fifty years later people drove cars. During the same period the whole infrastructure in Stockholm changed; gas lights, water pipes, telephones and trolleys were installed, making the city the industrial center of the country. A new city plan was developed, something Strindberg used as a symbol of modernity and change in his poem “Esplanadsystemet” (1883). The city grew beyond its old boundaries to the current dimensions. At the same time, this was when the labor movement and revolutionary groups were born, as a reaction to the bourgeoisie and the increasingly visible gaps between social classes. 1848, the year Strindberg was conceived (and which he referred to more often than his birth year), was the year of the February revolution in France, and the Swedish translation of the Communist Manifesto, published in London that very year. 1879 was distinguished not only by the publication of Röda rummet (The Red Room) but also by the labor strike in Sundsvall; the first major, well organized strike in Sweden. During this time period the Swedish Social Democratic Labor Party (Socialdemokratiska Arbetarepartiet) was formed, as well as the Swedish Trade Union Confederation (“Landsorganisationen” or “LO”) and the Swedish Employers’ Confederation (“Svenska Arbetsgivareföreningen” or “SAF”) Sweden’s government changed from a parliament of estates to a parliamentary democracy. It was a dynamic, transformative era, and Strindberg rode the top of the wave of change. He was always looking for conflicts on which he could take a position, and wrongs (real or imaginary) that he could right; any topic on which he could sharpen his pen. It is difficult to describe August Strindberg; his books and his life and person seem impossible to summarize or explain – as if his life was a work of art. Indeed, he consciously shaped a persona through his letters and ostensibly autobiographical works, such as Tjänstekvinnans son (The Son of a Servant, 1886-87, 1909) portraying his marriage to Siri von Essen in En dåres försvarstal (A Madman’s Defense, 1895), and his mental crisis in Inferno (Inferno, 1897). Scholars agree that he staged his biography; and he considered the notion himself. On January 24, 1901, he wrote in Ockulta dagboken (The Occult Diary) ”I think of my life thus: what if all the terrible things I have experienced were staged for me, so that I might become a writer and portray all kinds of spiritual conditions and all kinds of situations. I was a writer at twenty. But if my life had been calm and uneventful I would have nothing to say. ” This self-presentation is probably the reason that the powerful persona of Strindberg has never detracted from his art, (as opposed to the life and work of someone like Carl Jonas Love Almqvist). What scholars disagree about, is to what extent and how consciously he reconstructed his story. Johan August Strindberg is born the third son (the first within wedlock) of steamship commissioner Carl August Strindberg and Ulrika Eleonora (Nora) Norling, daughter of a master tailor. Their home is solidly bourgeois: well ordered and a little rigid, but prosperous and safe. For most of his childhood, Strindberg’s family lives in various “malmgårdar” by Nortullsgatan, then almost in the country. (“Malmgårdar” were summer houses built for the elite mostly in the seventeenth and eighteenth centuries, usually with stables and livestock, often with large gardens for cultivating exotic plants or medical herbs.) His mother was from a lower social background than her husband, but was not a maid; on the contrary she had both servants and housekeeper. She is described as kind and considerate, but withdrawn, and is soon worn out by constant pregnancies. She gives birth to eleven children, of which seven survived: Axel, Oscar, August, Olof (Olle), Anna, Elisabeth and Eleonora (Nora). Already in 1862 she dies of pulmonary tuberculosis, just after her thirty-ninth birthday. Within a year of her death, his father remarries; his bride is the thirty years younger, twenty-year old housekeeper. Strindberg is thirteen. At school he is described as shy and retiring, but his self-esteem is strong and he is also the only one of the children who graduates from high-school. After graduation, he goes to Uppsala to study, but without much commitment or success. Simultaneously, he takes numerous odd jobs and eventually begins to concentrate on an acting career. As he tells it, his writing talent is brought to life in 1870, when he fails an employment test. The day after he wakes up hung over and unbalanced, he begins to fantasize, and after a few hours he has finished a comedy; it takes him four days to write it down. At a furious pace, he continues to produce one piece after another. He is immediately successful and a couple of his plays are produced at the Royal Theatre. When things go well, he describes himself as drunk with happiness, when adversity comes, he threatens suicide. Despite his intermediate position in the family, stories about him bring to mind a typical youngest child – always on the move in order to keep up with the older siblings, with a constant feeling of being neglected and overlooked – always being too little. In 1872, twenty-three years old, he is ready for his masterpiece. That summer he moves with three companions to what became his summer paradise, Kymmend?in the Stockholm archipelago. In exactly two months he writes Mäster Olof (Master Olof)– the play about Olaus Petri, leader of the Swedish Reformation in the sixteenth century. A powerful drama that he will return to and rework over and over in the coming years. To Strindberg’s despair and rage the play is rejected. To support himself, he starts working as a freelance writer. He writes about every topic imaginable for all kinds of newspapers and magazines, among others Dagens Nyheter. He has a violent quarrel with his father leading to a break; they never again see each other. He has already, in 1874, met and fallen in love with Siri von Essen, a one year younger Finno-Swedish woman with dreams of becoming an actress. She is in a marriage of convenience, her husband a captain Carl Gustav Wrangel. After a chaotic period of courtship they married on New Year Eve 1877-78. The following year the two work on their artistic careers and the money Siri brought into the marriage gives them a carefree life. But their extravagant lifestyle and a recession combine to tap their resources and in January of 1879 Strindberg is forced into personal bankruptcy. It puts him back at his desk, producing another feat to rise again. In November of that year Röda rummet (The Red Room) is in the book stores and becomes an instant success. The milieus and the characters are from his time as a freelance writer, and readers experience the portrayal as unvarnished, almost crude. The novel becomes the big topic of conversation and Strindberg once and for all enters into the center of public consciousness. Another successful and relatively quiet period begins. Strindberg collects materials and writes historical works; among other things he is involved in collecting artifacts for Nordiska Museet (the Nordic Museum). But in 1881 he can no longer keep from sticking his chin out. He attacks Erik Gustaf Geijer’s Swedish history, Geijer, at that time the national authority on Swedish history, as being too centered on royalty at the expense of the people, promoting his own Svenska folket i helg och söken (The Swedish People at Work and Play)1981. The reaction is instantaneous and violent: from this point, Strindberg is the portal figure of the young generation. He further intensifies the conflict by berating the establishment in the satire Det nya riket (The New Kingdom) 1882. The next year the family travels to the continent. Strindberg wants peace and quiet to work and Siri is forced to give up her acting ambitions. The couple have two children, Karin and Greta (3 and 2 years old respectively), and a son (Hans) is on his way. They plan to return to Sweden after the winter but will remain abroad for nearly six years. They journey to France, Switzerland, Italy, Austria, and Denmark. The family moves constantly. Strindberg visits Sweden only once during this period. Reluctantly, terrified of being thrown in jail, he arrives in October 1884 to face blasphemy charges for Giftas (Getting Married). A month later he gets on the night train to the continent, acquitted and declared a hero. Leaving Sweden does not mean leaving Nordic culture behind. Strindberg’s friend and illustrator, the painter Carl Larson, lives in France, as do the Norwegian authors Bjönstjerne Björnson and Jonas Lie. Even during the wandering of the next few years he stays in touch, writes large numbers of letters and visits friends. It is a very productive period, Strindberg writes one masterpiece after another: En dåres försvarstal, Tjänstekvinnans son, Fadren, Fröken Julie and Hemsöborna – a yearning, fragrant portrait of the Swedish archipelago. (A Madman’s Defense, The Son of a Servant, The Father, Miss Julie, The People of Hemsö. But it is also the end of his marriage. Strindberg is disparaging and condescending toward women and he is finally so aggressive in his comments about women in general and his wife in particular that Siri begins to suspect he has gone mad. When the family returns to Sweden in 1889, nothing remains but divorce. It is finalized in 1891. Strindberg is free but he has lost his inspiration. In 1892 he takes the train to Germany, settling in Berlin and gets to know, among others, Edvard Munch. There he also meets Frida Uhl in 1893 and a few months later they are married. Strindberg is interested in science and begins experiments that over time become increasingly focused on alchemy. In 1894 the couple’s daughter Kerstin is born. That summer he travels to Paris and the Inferno crisis. Strindberg remains in Paris until the end of 1896 and there lays the groundwork for a new direction in his writing. In Röda Rummet (The Red Room) his description of Stockholm ”an evening in the beginning of May” had been in competition with the writing of Victor Hugo – leading man of French romanticism. With Fröken Julie (Miss Julie) he created a naturalistic, psychological drama inspired by French naturalism; events are downplayed, the drama occurs within the characters and the dialogue sounds like regular speech. Now, in the new works, the struggles of the soul also give shape to the content and realism gives way to something more closely aligned with symbolism. Strindberg begins Ockulta Dagboken (The Occult Diary), filled with magical connections and hallucinatory experiences. In 1896 he returns to Sweden where he continues his experiments and attempts to interpret the magical and mystical connections that surround him, given shape in Inferno, Till Damaskus and Ett drömspel (Inferno, To Damascus and A Dream Play). At the same time he begins a series of historical pieces reminiscent of his earliest dramatic works:Gustav Vasa, Erik XIV (Gustav Vasa, Erik the Fourteenth), etc. A new productive period has begun. In 1901 he remarries for the third and last time. His wife is the actress Harriet Bosse. In 1902 they have a daughter, but the marriage falls apart a year later. In 1907 he stirs up sentiment with the satire and caricature Svarta fanor (Black Banners), the media reaction is harsh. But this is just a taste of the last great battle that is about to take place, ”Strindbergsfejden”, the Strindberg feud. In 1908 he has moved to his last dwelling, ”Blå Tornet” (“the Blue tower”) at Drottninggatan in Stockholm, and two years later he makes a savage attack on the establishment in a series of articles. One of the reasons may be bitterness at seeing his colleagues honored – Heidenstam was given an honorary doctorate in 1909 and Selma Lagerlöf received the Nobel Prize in literature – or it may have been his ambition to shape literary historiography. In any case the result is the most extensive literary debate in Swedish history – the parties throw epithets at each other, surprisingly coarse. The battle finally fades sixteen months later after about 465 contributions have been published in various papers, but with a ceasefire only – there is no peaceful settlement. When the young labor movement celebrates him as its author on his birthday in 1912, it is a clear declaration against the economic and literary upper class. Just a few months later Strindberg falls ill with abdominal pain and dies. His ex-wife Siri had died only recently, and in the same year one of his daughters as well as his nemesis, the permanent secretary of the Swedish Academy, Carl David af Wirsen, die too. 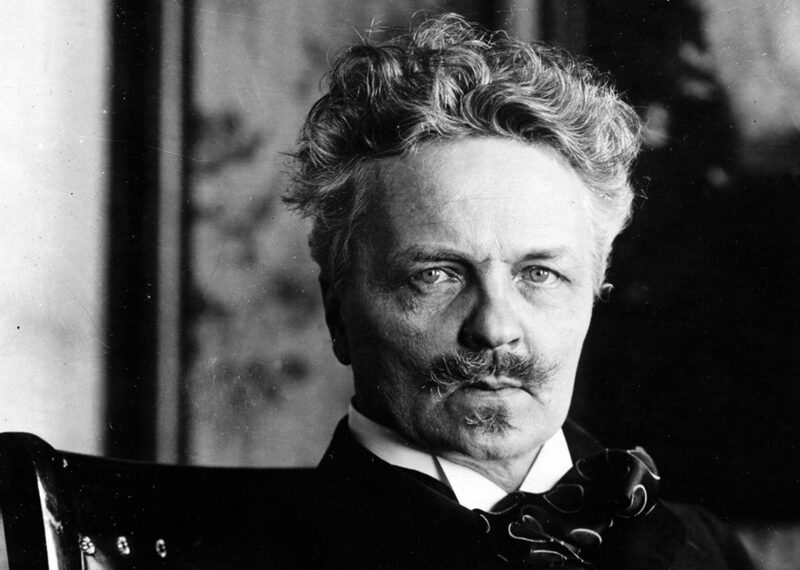 In a letter Selma Lagerlöf comments ”is it not strange that Strindberg pulls the people around him with him into death; first his wife and his daughter, and now the man who stood against him throughout his life. The chief heads to Valhalla with a large retinue.” (”[…] är det inte besynnerligt med Strindberg, som drar de sina med sig i döden först hustrun och så dottern, så har han alltså tagit med sig den man, som stått honom mest emot hela livet igenom. Hövdingen drar till Valhall med stort följe.”) Overall, Strindberg is undoubtedly our greatest author ever. His prose is the first modern Swedish and in its entirety his work can be described as the breakthrough of modern literature in Sweden. The critic can argue his standing in a particular genre, but through his incredible productivity and his breadth he will always challenge even the most reluctant supporter. In addition, he is doubtlessly the most prominent dramatist in Swedish history. Internationally too, he is our most well known and influential writer, and the literature about his life and works in numerous languages is almost endless. Biographies are dominated by two works. The low key, methodical biography by Gunnar Brandell’s Strindberg – ett författarliv (1983-89 ) in four volumes is the most comprehensive, detailed, and most traditionally academic. The second work, August Strindberg(1979), by Olof Lagercrantz, follows closely and animates the human being and the writer. The book is colored by Lagercrantz thesis that Strindberg really was an introvert, afraid of revealing himself and staging his life in letters and ostensibly autobiographical texts, particularly during the Inferno crisis when earlier scholars have claimed that Strindberg was mad. Lacercrantz’ biography – the most widespread – has been translated to English (1984, transl. by Anselm Hallo), German (1980, transl. by Angelika Grundlach), and several other languages. The standard English-language biography, however, seems to be Michael Meyer’s Strindberg: A biography(1985), despite some mixed reviews. Michael Robinson, the renowned British Strindberg-scholar, argues that: ”Generally accurate where dates and other factual details of e.g. place and publication are concerned, its reliability is rendered problematic by Meyer’s antipathy for his subject, a tendency always to place him in Ibsen’s shadow both as a man and writer, and a lack of understanding for the majority of his works, which he often misrepresents and sometimes misinterprets. This is especially the case where his prose fiction is concerned, but also applies to many of the plays not included in Meyer’s select canon of viable works.” In his recently published The Cambridge Companion to August Strindberg (2009), Robinson mentions an alternative biography by Birgitta Steene,The Greatest Fire: A Study of August Strindberg, (1973), and describes it as: ”A reliable overview of Strindberg’s career as a whole.” In German, besides the translation of the biography by Lagercrantz, there is Göran Sjöströms short biography (pp 17-246) in Der andere Strindberg: Materialien zu Malerei, Photographie und Theaterpraxis Texten von Göran Sjöström , Ture Rangström und Wolfgang Pasche (ed. Angelika Gundlach, 1981). And in French, there is a biography by Elena Balzamo, August Strindberg: visages et destin (1999).